Need to get time-sensitive information to your event participants quickly? Our text messaging feature can help you communicate important details to your group or send event invitations straight to their mobile phones. And a bonus? You’ll avoid those pesky reply-all group text chains that keep your phone buzzing all day long. Coaches updating team parents on game time or location changes. Nonprofit coordinators reminding volunteers of their shift details, where to check in or what to bring. PTA leaders inviting busy parents to sign up for events — on-the-go members can easily click on the link in the text message and sign up on their phone! College organization leaders reminding students of their sign up slot commitments a few hours beforehand. To get started, invite your sign up participants to opt in to receive text messages. Log in to your account and click the "Messages" icon on the left side of the Sign Ups account page. Once you hit the “Compose” option, click on “Text Message.” You can then send an email that will invite people in your group to opt in to text messages. Your group participants will receive an email with a button that takes them to our site. They’ll enter their mobile phone number and submit if they’d like to receive texts. 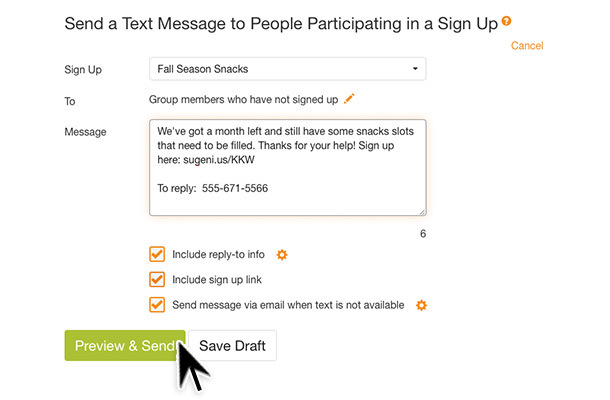 Once people have opted in, head back to the “Compose” area of “Messages” to send a text message to your group members. After selecting “Send a text message to people participating in a sign up,” choose the correct sign up and who you want it to send to — people who have signed up, people who haven’t signed up, people in specific groups or individuals in slots you choose. Next, compose your text message. You have the option to include the sign up link and your mobile phone number as reply-to info. Plus, you can still send the message as an email for participants who haven’t opted in to receive texts. After you preview and send, you’ll get a confirmation email, and your group members will get a text message. If you’re on our mobile web app, look under the “Tools” area and select “Messages” to compose a message on your phone through the same steps. Participants who don’t opt in to texts can receive updates via email instead, and your participants can opt out of text messages at any time. Silver subscribers can send up to 150 text messages per month, Gold has access to up to 500 and Platinum accounts can send up to 1,500. With this powerful feature, your group organizing will be more efficient than ever! Get started with text messaging today. I read this as the number of texts allowed per month is the number of messages sent to the group, not the total number sent--eg, 1 text sent to a group of 20 people counts only as 1 text and not 20. Is this correct? Hi, Jessica. When sending a text message, you cannot attach a file to the message like you can when sending an email message. However, you can include the link to the sign up in your text message, and attach the documents to the sign up. Your participants can then access the attachments by clicking the sign up link. Can you send attachments to the text messages like in emails or only links? Hi Krista, We offer the ability for participants to receive reminders via text message. To do this, the individual user must choose the option to receive texts. From *Settings* located on the left side of their account page, click on the notifications tab to set reminder preferences. 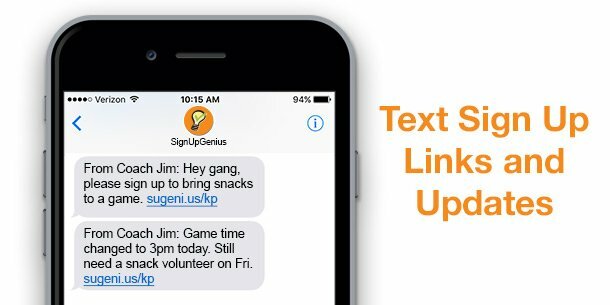 Anyone with a SignUpGenius account who is participating in a sign up can choose to receive reminders via text. 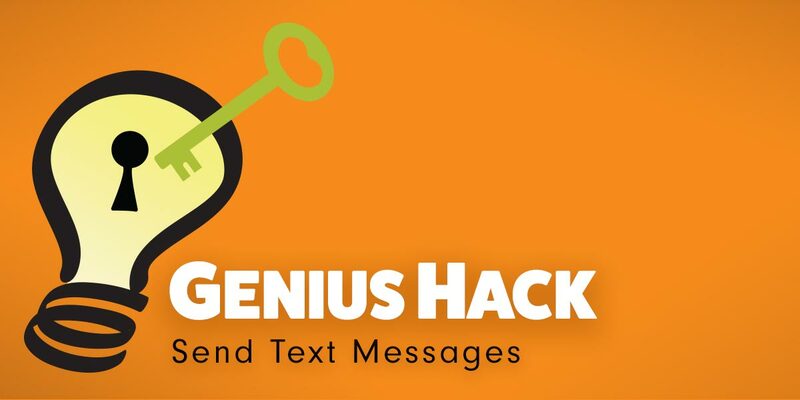 Can automatic reminders of sign up genius shifts be sent out via text if people enter their phone number? You must purchase a paid plan to use the texting feature. It is not available with the free trial. As always, participants have the option to receive *reminders* via text. From *Settings* located on the left side of their account page, anyone participating in a sign up can choose to receive reminders via text. Is the texting of sign-ups feature available in the basic plan? The free trial? Invite people to Opt-In to Text Messages. From there, simply select the group or groups you want to invite to receive texts. We will send out individual texts to the people you select. Your group members will not know the mobile phone numbers of anyone else you invite. You will be able to confirm that each text was delivered in the Sent tab of our Messages area. 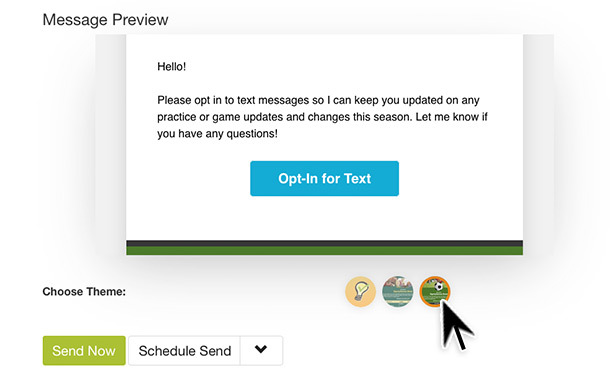 Why not initiate the text opt-in/out component upon setting up a sign-up and sending out invitations. Hopefully there is a batch opt-in/out invitation function. Good job on finally adding the texting component. Its been a long time coming. This is a great feature! very exciting and looking forward to it! I am sooooooo excited about this feature! Thank you! Log in to your account and head to the Messages tab. Once you hit the “Compose” option, click on “Text Message.” You can then send an email that will invite people in your group to opt in to text messages.